A quick scavenging trip to collect a few leeks and to do the monthly pics. Not much change from last month except that the muntjac have got in among the broccoli which is now somewhat reduced. 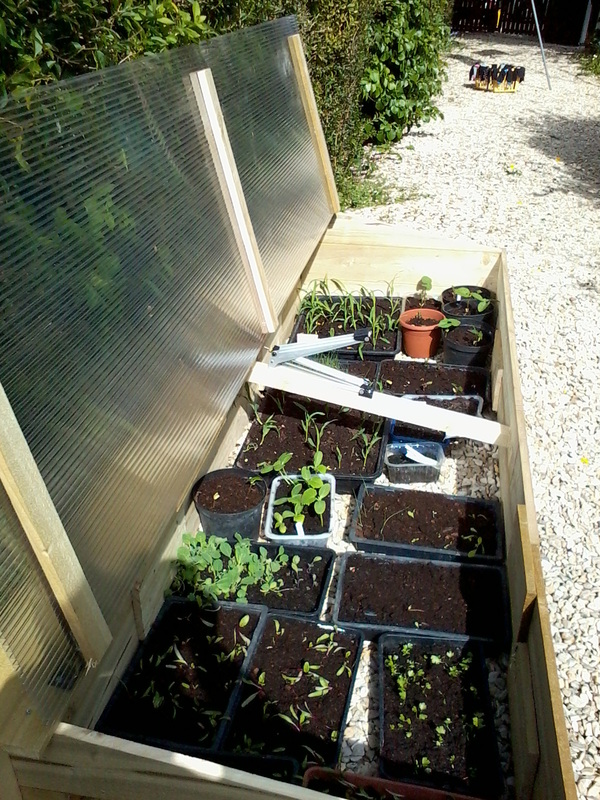 Considering taking down the cabbage cage as they may as well tidy the brassicas under there for me. Warm and wet October and me a bit more pre-occupied with the boat so the weeds have had a happy time. Got the garlic in to-day, could have done with going in earlier but this the first time weather, inclination and soil condition allowed access for the rotavator. Some well caterpillar chewed brassicas, leeks, radiccio, beetroot, spinach beet and leeks about all that is left that is edible. Still picking beans and each time I do I am convinced it will be the last but still they come. Tomatoes and courgettes still producing too. Weeds making up for lost time as is the grass. At last a little rain but too late for the potatoes, lots of them but small. Excellent tomatoes, my best yet I think. The courgettes continue in abundance as do the runner beans. Not sure what is to be found lurking in the cabbage cage though. Suddenly all the cultivation problems are over and the summer is in full swing. Everything growing like mad and in surplus. 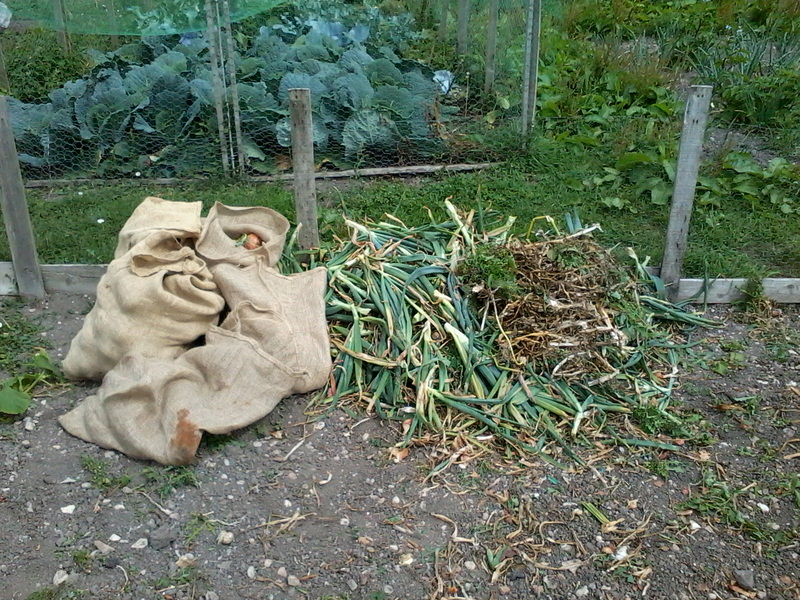 Garlic and onions harvested but a poor crop of garlic, left too long, the onions look good though. Picked the first sweet corn on the 1st of August, a record. Cucumbers and courgettes doing rather too well and we are setting them out on the roadside for all to take. Putting the surplus out to the road has been revealing. At first nothing went and we thought we would be stuck with compost. 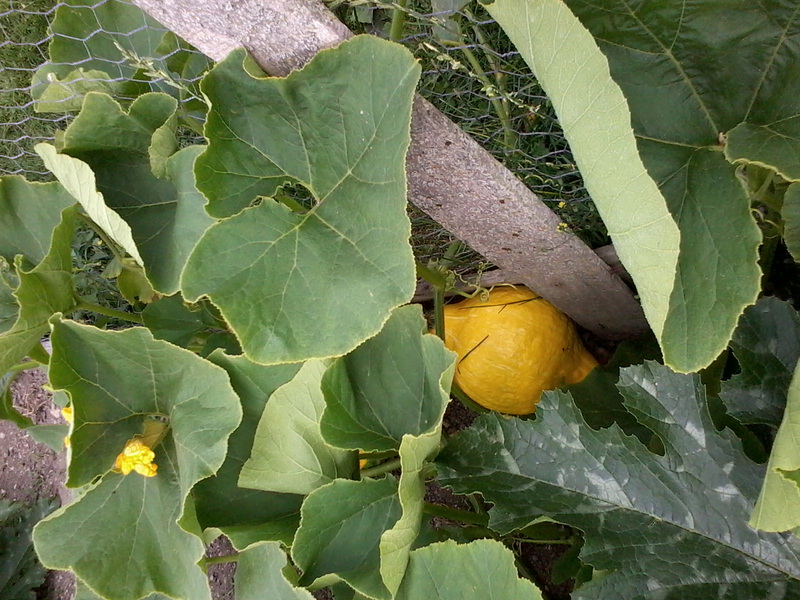 But it turns out that roadside courgettes are just like the birdfood we put out. Nothing happens for a while but then suddenly 'they' know and all disappears miraculously. Rosemary has enjoyed seeing people walk off triumphantly with their 'prizes'. We had an unexpected call at the door to thank us for our vegetables and to pass on her hand-made re-cycled cards. This was much appreciated and should you need a card, e-mail wizzywise@btinternet.com to see what is available. Sj always claims that the only time people lock their cars in New Hampshire is during the the courgette season as otherwise friendly neighbours fill the un-locked cars with surplus marrows. I'm working on more ways to use, and store them, so far with not a lot of success. You can see my efforts at cocmains.php#courgettes. I have two new recipes, one for pickled cucumbers from Terry and another from our trip to Geneva, neither marked up as yet but help with other recipes would be much appreciated. When I went up to the allotment to-day [13 August] it all looked even more verdant than the early August pics. Right now one is glad of the odd depredation from the resident wildlife though they are making allotment life very difficult. Rabbits abound now that they are in their breeding season with the young ones very complacent about their life in the rabbit supermarket. Frank showed me where his runner beans had been grazed by munkjack deer,a better job than my hedge cutter can do...trouble is they don't like privet and are as scared of heights as I am on the scaffolding. Hiding below those innocent leaves...cucumbers! June turned out to be another difficult month. Windy, cool, dry. Still we have been digging rocket new potatoes for two weeks now and the mange toute and spinach have started to contribute to the common pot. The courgettes have suffered in the wind, despite the windbreaks. It has just occured to me to fasten them down with pegs so that they can't move and this has helped a lot. Onions and garlic all very green and 'toppy' but its bottoms we want. At last things are starting to move. Still a cruel wind but the soil is warm and moist so should be perfect. My plot looks like Southend beach on a bank holiday, covered with windbreaks. It is the time of year when I run out of space for all my seedlings and little plants. 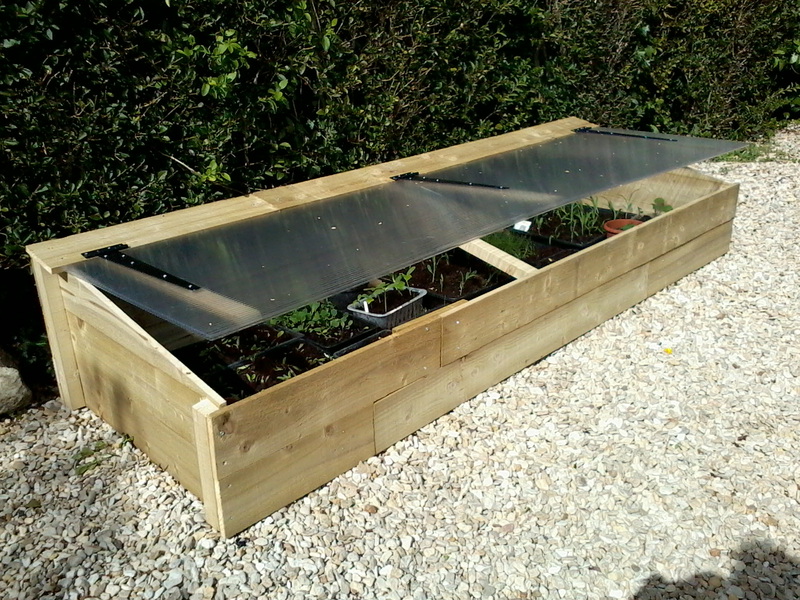 Nothing for it but to make another cold frame. Not many lilacs bred this month I am afraid but despite the cold and lack of rain, things are moving and I have been able to get out onto the allotment and catch up with rotavating and site preparation. One bonus has been that the weeds havn't grown [much] either [yet]. The potatoes are in, Frank has the first leaves on his showing, but no sign of mine yet. I think they are wise. 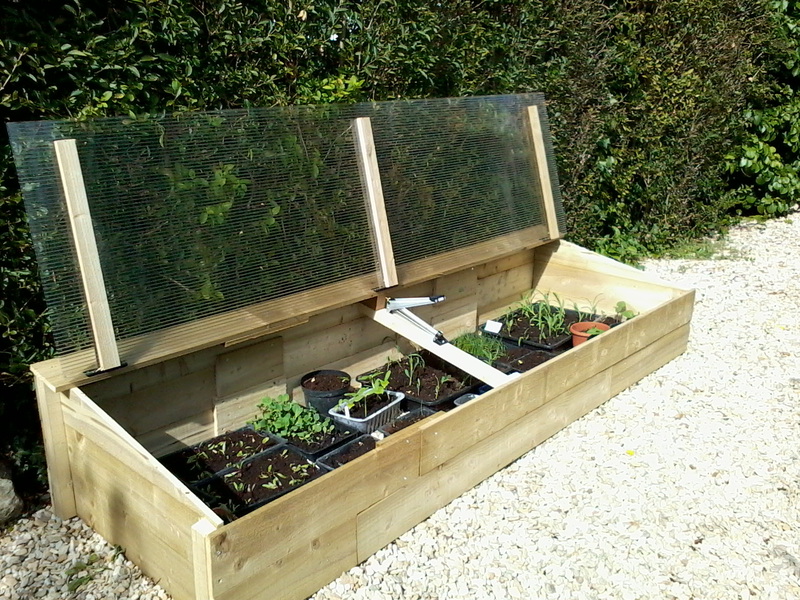 Some nice broad bean plants, well protected by cloches and early peas and mange tout in and running. Well you may have wondered what happened to March. Well off it marched, the coldest on record and snow and low temperatures all month with hardly a visit to the allotment. Now we are in April and at least it is dry but as Keith noted to me this morning: 'That wind is straight from Siberia' and so it is. 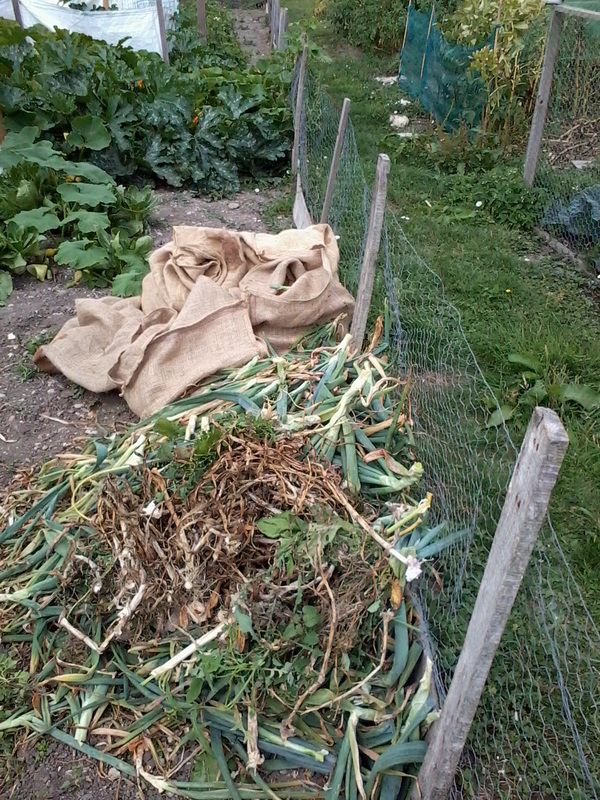 At least the patch is almost all rotavated now and compost from home and the allotment spread. I was going to put in potatoes and onions to-day but decided that the soil was still too cold. Frank has shallots and some nice little broad beans in place, mine have just germinated, I'm holding everything off. One of my winter tasks has been to get at least one communal mower operational. This year, Frank aquired yet another mower which purported to be 'brand new' except that when his brother had it running it produced a lot of smoke so he gave up with it. That didn't sound too bad to me so the mower duly came for 'a little visit' to the workshop. A good clean, a wash of the air filter and off she goes with no smoke! Could this be the easiest spring preparation yet? Well no, after it has been running a while, sure enough it produces white clouds of something. Hmm could it be that petrol is leaking from the fuel tank and dripping onto the hot exhaust? Sure enough, that was exactly the problem and as it was a manufacturing fault it was beyond repair, a replacement was ordered. Fortunately, they had changed the design so the tank was a separate unit from the cowl and recoil starter. This gave me a bit more hope that the Chinese manufacturing processes might be up to making the unit properly if it was done in separate bits. In the Autumn, Kevin had given me some large, though strangely shaped, pieces of roofing grade sterling board. Another little winter job has been to convert these into a shed for the divers allotment mowers. So I've been working round an Ikea flatpack shed and a refurbished mower all winter in the workshop and have been waiting for a day when it would be dry enough to erect it and move in the new mower. That day has just arrived though the car did slip and slide a bit on the muddy ground. Also took the opportunity to have a quick look round my patch and discovered rabbit droppings on the shed roof! Closer inspection also revealed that they had liked it so much that they had tried to make a burrow. A fellow allotmenteer has suggested that "The rabbits were probably marooned there on Leadbeatershed island during the flood" she could very well be right though there is no sign of any other animals two by two. A wet start to the year and this combined with the cold, has meant snow as well, so this was my first opportunity to get up to the allotment since Christmas. Went by car and parked it on the muddy verge before venturing in to see what had been happening below the blanket of snow. Pleased with the state of the garlic and it was good to see the little red shoots of the Timperley early rhubarb just appearing. Walking round was difficult though as it is very wet and slippery. No doubt the needs of the brassica stealers were greater than ours but I was planning on having curly kale instead of spinach in Sj's Spinach Pie for tonight's evening meal. 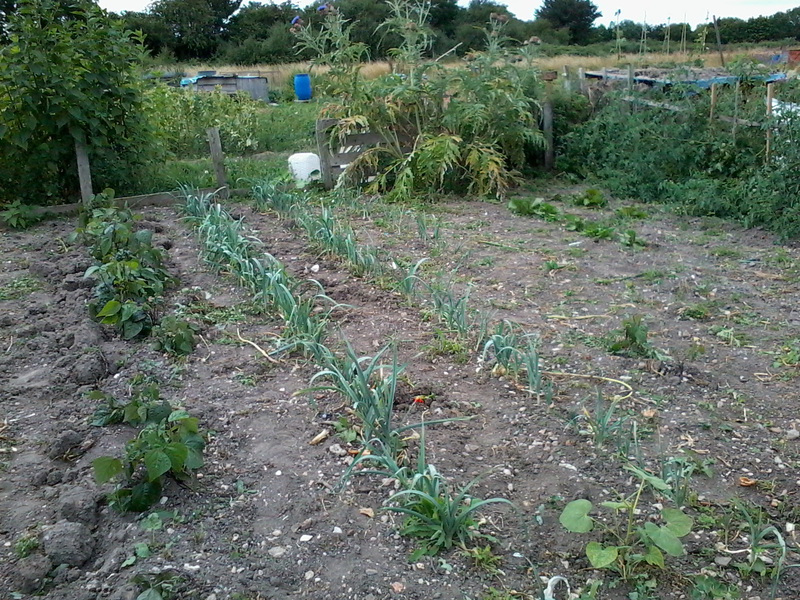 The leeks are holding up well though and the Muntjac deer. [AND don't you dare say 'ahhhh' if you follow the link.] have neatly trimmed off all their tops so this is allotmenteering à la Tesco. The leeks will replace the scallions in her recipe and we will have to make do with frozen spinach instead of the kale.